This cozy 2 bedroom with a pull out couch home has hardwood floors with an open kitchen and living room area. Located on a private road in a lakeside community, this property offers a quite, relaxing atmosphere. Fully furnished, this home also comes with a washer & dryer as well as air conditioning, bedding, linens, cooking utensils and even paper products. Enjoy beautiful floral landscaping while you relax on the patio which includes an outdoor grill and seating or rent a boat from South Shore Marina and enjoy the lake to it's fullest. A private dock is also provided for your pleasure along with an outdoor grill and seating. deliver a delicious meal to you while it's still hot! 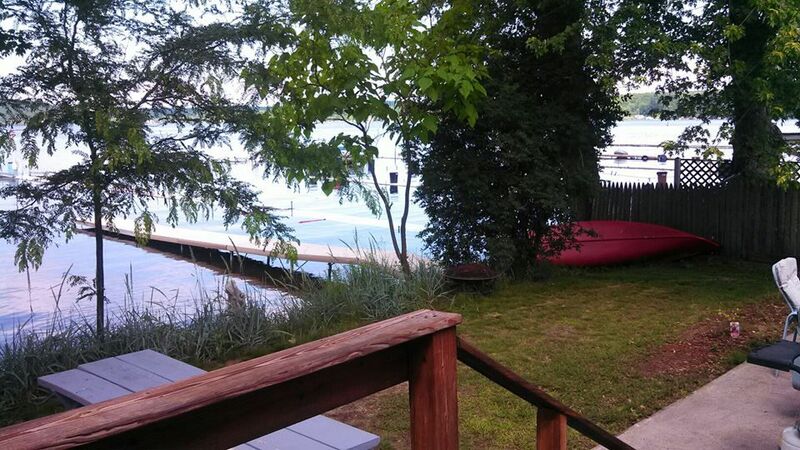 Enjoy beautiful views of Saratoga Lake from dawn to dusk! Boat docking can be done next door at the marina for a small fee. Private dock is off the patio. Close to West Mountain and some other ski resorts. Ice fishing done on Saratoga Lake as well as snow mobiling. Cozy spot close enough to town. Far enough away for the cottage feel. My family loved it we will likely stay here again. We were able to bring our dogs and found it comfortable for all of us. We enjoyed the closeness to the lake and went out paddling a couple times. Clean and had all we needed for cooking, etc. This property is on the lake and sadly we had poor weather to be able to enjoy the lakeside. Inside is a never upgraded 1960's trailer that is clean, but worn. Lots of stains that could not be removed from wallpaper, walls, sinks. Good for a family that wanted a "Lake outdoor theme." The leather couch was torn and the landlord came early one morning to apologize--was quite odd and uncertain why he came by at that time as we did not make any comments anywhere. We liked having the bedrooms on opposite ends of the trailer as hubby snores and then daughter does not sleep. Had enough room between to muffle the sound. Had lots of kitchen items, but appeared to be leftovers from other settings as had no cereal bowls, but many cups and plates. The owner gave us a wrong address and we arrived quite late in the evening. Address was to another long term lease that the owner had and luckily the lights were on and when we approached that house, we could see someone inside sleeping on the couch. We re-looked at the website and were able to find the correct home from the map. Picture was for the home next to the trailer--but we knew that the rental was a single story home. The owners may want to update the website to reflect this home rather than the larger one next door as confusing. Owners were responsive and caring. Had a good time fishing and touring the lake. Caught some fish and enjoyed having the for dinner. House trailer was big enough for the four of us. Went to Saratoga horse track and enjoyed visiting one of the premier tracks on the east coast. The house was supplied well and we enjoyed our stay there and I would recommend it . We were looking for a place to stay that would allow us to explore the Saratoga Springs area. While the accommodations were not luxurious, it had everything we needed and it was close to Saratoga. The neighborhood was quiet and we got to watch the ducks on the lake every morning before setting off for the day. One thing that would have been nice was a sheet with instructions from the home owner: e.g. Wi-Fi password, what we were expected to do with linens at the end of our stay, etc. Overall, we enjoyed our stay. If cancelling you lose your security deposit of $500 holding the dates and if you cancel with in 60 days of the visit you lose the full amount.